Thousands of people have been evacuated on the Indonesian island of Bali and on Ambae island in Vanuatu as two volcanoes threaten to erupt. The entire population of Ambae is being moved from the path of the “increasingly active” Marano volcano, also known as Lombenben, according to the Pacific nation’s government. On the Indonesian island of Bali, more than 134,000 people have been taken to shelters as authorities warn that Mount Agung, in the island’s north, could erupt at any time. Both volcanoes sit on the Pacific Ring of Fire, an area of intense seismic activity that stretches 40,000 kilometers (25,000 miles) from New Zealand to South America. That they’re showing signs of erupting at the same time is pure coincidence, said Benjamin Andrews, of the Smithsonian Institution’s Global Volcanism Program. Vanuatu’s Ambae island hasn’t been evacuated on this scale since an alert in 2005, Minister of Land and Natural Resources Ralph Regenvanu told CNN. Most of the island’s 11,000 residents are being taken away by boat, but some are also being airlifted to evacuation centers on Vanuatu’s Pentecost and Maewo islands. On Wednesday, a New Zealand Defence Force (NZDF) aerial survey found “huge columns of smoke, ash and volcanic rocks billowing from the crater of an erupting volcano” on the island, according to a press release from the agency. The alert level is at 4, the second highest on the scale. 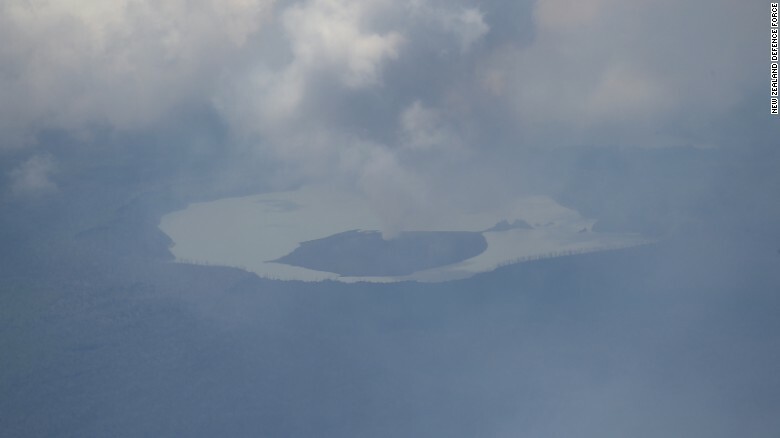 “Ambae volcano is in an ongoing moderate eruption state,” a statement from Vanuatu Meteorology and Geohazards Department said. People in local villages could experience the danger of flying rocks, volcanic gases and acid rain, the statement added. Imagery taken during a New Zealand Defence Force aerial survey showing activity from the Monaro volcano on Vanuatu’s Ambae Island. “The principle concerns here are that the volcano can eject volcanic rocks to distances of many kilometers from the crater, and that the volcano could erupt ash and/or emit sulfur dioxide,” said Andrews, from the Smithsonian Institution’s Global Volcanism Program..
Australia had responded to a request for assistance, pledging up to 20.5 million Vatu ($190,000) in “much-needed supplies like food, water, shelter and hygiene kits for affected communities on Ambae,” a Vanuatu government statement said Thursday. Australia was also funding surveillance flights over the volcanoes on Ambae and nearby Ambrym island, it added. In Bali, residents are still being moved outside an exclusion zone that stretches 12 kilometers from the center of Mount Agung. More than 134,000 are living in evacuation centers, sleeping on floors and waiting for something to happen. 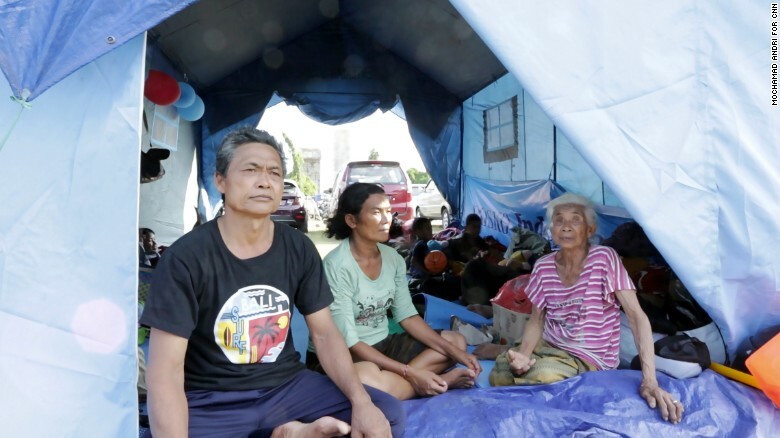 “It’s been six days since we are here, we want to go home,” said Wayan, 65, who like many Indonesians only goes by one name. He evacuated with this elderly mother, wife, children and young grandchild to the Swecapura sports arena. Wayan also fled his home back when Mount Agung last erupted in 1963. Back then, there was no evacuation plan, people just “ran to save themselves,” he said. More than 1,700 people were killed and many villages destroyed. Wayan sits with his family at the Swecapura evacuation center in Bali. This time, 447 temporary shelters have been set up outside the exclusion zone around the volcano, according to the National Disaster Management Agency. Ngurah Rai International Airport remains open but is on alert in case of ash disruption, and there are plans to bus people to other airports, if needed. 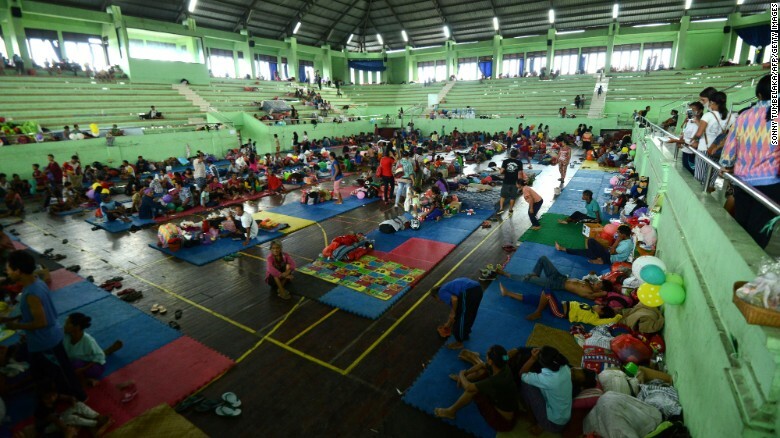 People wait inside an evacuation centre in Klungkung regency, on the Indonesian resort island of Bali on September 25, 2017. Seismic activity continues in the volcano and the alert level for an eruption has been raised to 4, the highest warning level on the Indonesian scale.